The apartment is located in the plateau of Solto Collina on the western shore of Lake Iseo. The beautiful facility is surrounded by greenery and offers a magnificent view over the mountain and of course a wonderful view of the lake. Back to Casa Alessandra has a beautiful pool and a large private pool. Casa Alessandra offers a personalized holiday experience in beautiful natural surroundings and the preferential sports. Our apartment has 3 bedrooms, 3 bathrooms with a shower / WC, a large living room. The kitchen is modern, functional and equipped with cooker hood, refrigerator, coffee maker and dishes. The apartment has a separate entrance and set-up is modern and beautiful. 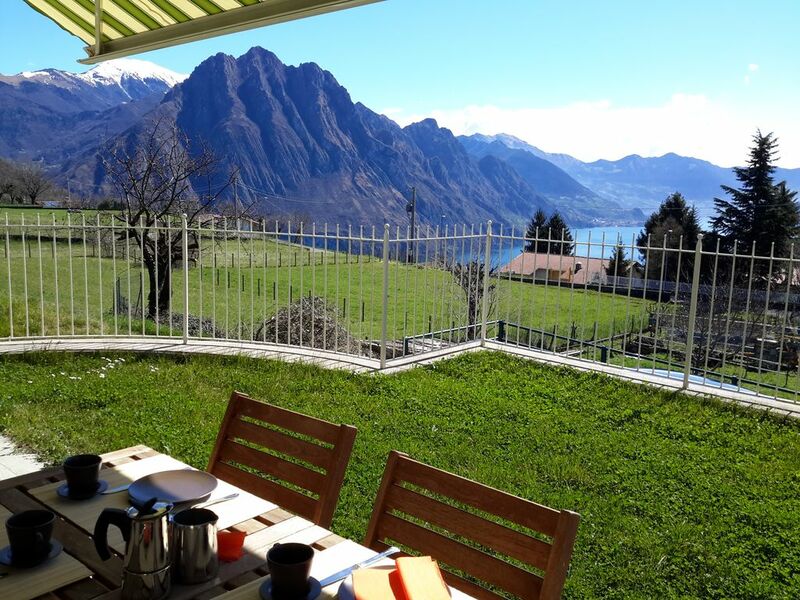 It has a lovely terrace with BBQ with wonderful views of the lake and the mountains. 1 week in het hoogseizoen hier verbleven. Locatie en appartement zijn prachtig met uitzicht over het Iseomeer. Geschikt voor iedereen die van rust houdt en het echte Italiaanse leven. Eetgelegenheden ruim aanwezig in de nabijheid en op 15 minuten rijden mogelijkheden voor boothuur en andere watersportactiviteiten. Loved the apartment, surroundings, pool and stunning view. Everything was in tip top condition and we had a perfect stay. A bit far from restaurants and supermarket though. We just got home and we wanted to thank you, for providing us with such an excellent appartement! We really enjoyed our stay and everything was the way we wanted it to be. The apartment was in great condition, and had great facilities. The location and the view over the Iseo lake was amazing. Once again, thank you very much for your great hosting. However, the reason for 4 stars instead of 5 would be the slow internet. For us it would have been great to have proper, consistent internet with a somewhat useful download speed, but this was, sadly, not the case.